Kelley Benck took the Project Make class at Analy High School in Sebastopol, Calif., and started interning last spring. She “was nervous about what sort of projects I would be asked to do, but those jitters were shaken away when I was handed the daunting Tesla Coil.” She hopes to design and 3D print a model 1966 Austin Healey. Hey fellow Makers, my name is Kelley and I am an engineering intern here at MAKE. I’m here just to tell everyone about my summer experience here in the MAKE Labs. I became familiar with MAKE during my senior year of high school when I was in my school’s Project Make class so I knew this was a place where I wanted to work. Nervous to be here on my first day, I was not sure how quickly I would be given a project, so I was a little shocked when I was handed the Six-Pack Tesla coil. At first the Tesla coil seemed to be a daunting task, but once I got a hang of the lab and a solid understanding of the project it was basically smooth sailing. Fellow intern Brian Melani had started some of the build before I began my internship, so I got to do a lot of the wiring—I wired the terry filter, the capacitor (the six pack of beer bottles), the spark gap, the ground connection, and connected everything to the primary and secondary coils. It ended up being a fun project that helped me get to know a lot of my fellow interns. The Tesla coil was almost a success on the first try, and with some minor modifications we got it working great. By chance, the placement of the primary coil tap point (the alligator clip) had the coil tuned perfectly on the first try. The only real problem with the build was trying to move it around—we had to take the Tesla coil apart to put it on a cart to move it to a safe location. So, MAKE fabricator Dan Spangler helped me design and build a stand for it that displays all the different parts of the build and allows it to be moved easily. I got to collaborate with the editorial department when the project was being published, creating an opportunity to see the workings of the company outside of the engineering area. After that I got to contribute to the upcoming magazine issues with various projects and helped a lot in building fun Maker Camp projects like the Giant Spin Art. 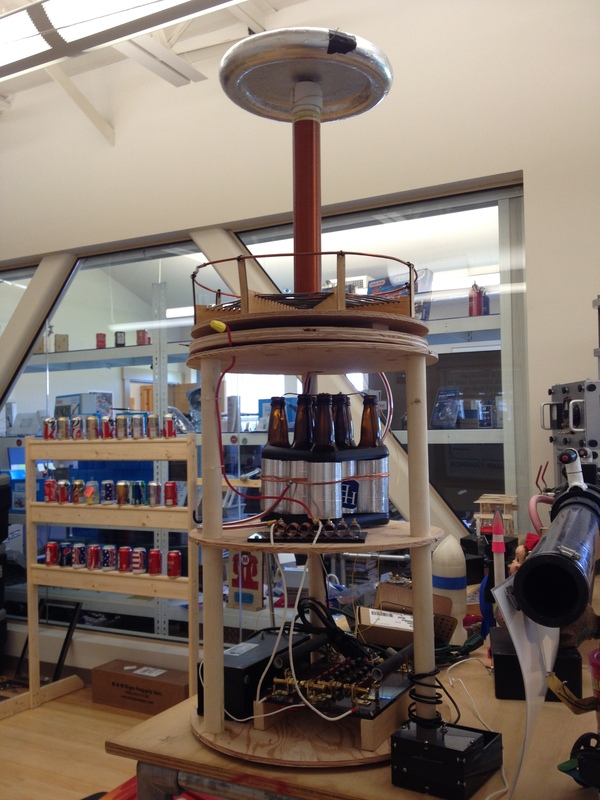 Building the six-pack Tesla coil was a fantastic introduction into my internship, and one I don’t see myself forgetting any time soon. It was an awesome internship, I learned a lot and was introduced to amazing communities; I feel very lucky to have worked at MAKE.